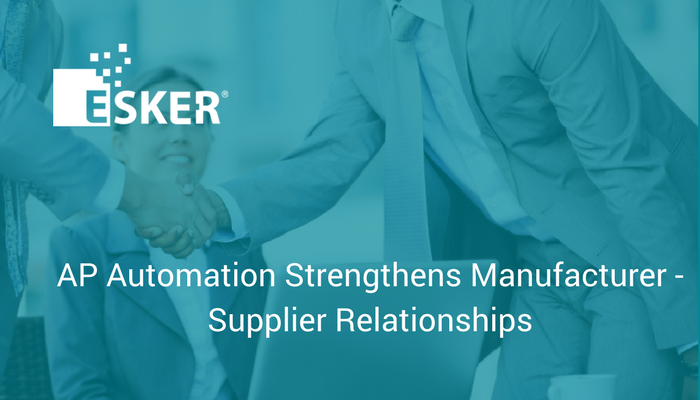 At its core, the relationship between manufacturers and supplier s in the semiconductor industry is based on how well the two sides can work together and, most importantly, making sure that invoices and payments are made on time. Issues with payments can ripple throughout the relationship. It has the potential to impact not only the financial sheets for the companies but also the trust and faith that make the partnership work. A semiconductor manufacturer needs to have faith that its suppliers will be on time with products; the supplier has to trust that if it sends out invoices, those bills will get paid in full and on time. A breach of trust and loss of faith can have a domino effect, leading to feelings of ill will, lost business or lawsuits. For many companies, the accounts payable (AP) process has made that much more challenging by the manual nature of the processes. The inherently complex processes of invoicing and receipt of payment that are crucial to making businesses run smoothly and keeping relationships strong are made that much more difficult when those processes are inefficient and error-prone. Many of the key touchpoints throughout the accounts payable process tend to be manual, which can lead to a range of challenges for organizations. They may run into difficulty retrieving invoice data on a timely basis and have little control or insight into that data. Errors can find their way into many of the points of the process, from incorrectly processing or misplacing invoices to inputting incorrect data or being late getting invoices sent. Even more, those errors can lead to too much time spent on fielding calls wanting to know the status of those invoices or payment, or on resolving disputes arising from those errors. Such inefficiencies can harm a business. They can lead to late payment fees, low staff productivity, and a larger dissatisfaction in the relationship with vendors. Just as bad, the time spent on dispute resolution takes away from the time company representatives have to do the work of building and improving the relationships with its partners. Automating the accounts payable processes can make a lot of these challenges go away and can go a long way in improving the relationship between manufacturers and their suppliers. For example, AP automation can enable such programs as dynamic discounting, where manufacturers are given greater flexibility in determining when to pay their suppliers and can receive discounts for products and services when they pay those suppliers earlier. The savings can be significant. We’ve seen customers save as much as $30,000 a month through early payment discounts, and those programs are possible because of the automation of their accounts payable processes. Automating the AP system from start to finish creates the efficiencies that can lead to programs like early payment discounts, which in turn only strengthens the manufacturer-supplier relationship. AP automation touches every person in the system, from the accounts payable specialist and manager to the controller, treasurer, and CFO, reducing the amount of clerical work, making it easier to monitor team performance and budget compliance, managing payments and gaining visibility into spending. Data needed for every step in the AP process can more accurately and quickly be collected, invoices can be sent out on a timelier basis and payments can be expedited to ensure that business between manufacturers and suppliers can continue to hum smoothly. Communication between vendors and their suppliers is improved through vendor access to self-service portals, and the archiving of data at every stage of the AP process can allow real-time reporting and analytics, giving buyers the information they need regarding their business relationships, including the vendors they’re buying from and how much they’re spending. The greater efficiency means that manufacturer representatives can spend less time fielding calls about the status of invoices and payments, and any disputes that do arise can be more quickly resolved. This means more time spent nurturing and strengthening the crucial relationships with their suppliers, ensuring smooth partnerships moving forward.